The first time a player wins a match – or even better, a tournament – is an indescribable moment. No fewer than four champions at the Canada Open celebrated their first ever victory in a Grand Prix event. Former #1 Lee Hyun Il was the only odd man out. Are the new titleholders at the Canada Open on the verge of new chapters in their careers? And is winning a tournament on such a level just a milestone or the helping hand they required to boost their upcoming performances? Lee Hyun Il (pictured above) was the only player who had yet won a Grand Prix title. The former World Championship bronze medallist and Asian Games silver medallist has announced his retirement from international competition three times now: in 2007, then again after both the2008 and 2012 Olympics. However two years later decided to start again, filling the void of singles players in the Korean team. While he’s not competing on such a high level any longer, 34 year-old Lee is still a formidable shuttler, as proven by his victory at the Sri Lanka Open in June where he defeated amongst others Iskandar Zulkarnain Zainuddin, H.S. Prannoy and Anand Pawar. In Vancouver, he was up against upcoming youngster Ng Ka Long, eager on winning his first ever Grand Prix. However the experience of his Korean adversary topped his youthful enthusiasm, sending Ng Ka Long back home with a straightforward 21-16, 21-14 defeat. More joy for Korea came in the women’s doubles. Choi Hye In (pictured above) and Lee So Hee finally won their first Grand Prix when they overcame compatriots Park So Young and Park Sun Young 21-15, 21-18. Choi and younger partner Lee So Hee are already playing together for some years now, with their first ever badminton gold going back to the 2010 German Junior Open. The two teams knew each other very well. Not only did Choi play with Saturday rival Park So Young earlier this year at the Korea Open, but the four girls all train together with former World Champion Ra Kyung Min when Choi and Lee are not at the national training centre. Much to the delight of the home crowd, Canadian Michelle Li (pictured) was also able to win the title. Li had a difficult second game, but still won from Pai Yu Po with 21-16 23-21. The 2011 Pan Am gold medallist in both singles and doubles is the first Canadian winner on home soil since the Open became a Grand Prix event in 2007. Luckily, Team Taiwan was already assured of a title in the men’s doubles. 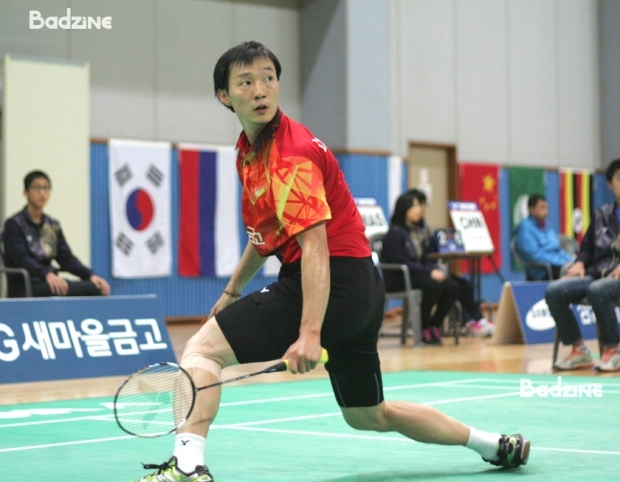 Liang Jui Wei / Lu Chai Pin overcame compatriots Liao Min Chun / Tseng Min Hao in the only three-game match of the day. Finally, Germany’s Max Schwenger / Carla Nelte (pictured below) won the ‘Battle of Europe’ surmounting Dutch duo in two close games and relegating De Ruiter/Barning to the runner-up position in Canada for the second straight year. Most athletes will now head to the United States for the U.S. Open Championships starting next Tuesday. Crowd-pleasers will be, amongst others, the men’s doubles pairing Mathias Boe and Carsten Mogensen, local favourites Eva Lee and Paula Lynn Obanana and defending men’s singles champion Nguyen Tien Minh. My commiserations Pbased. Our recently concluded inaugeral Australian Super Series was a resounding success. Thanks to players like Super Dan, Lee Yong Dae, Saina etc. No need for commiserations man because those who try to sell crap deserve nothing but misery and bankruptcy. That’s Canada for you, if the taxes don’t kill you, then the taxes on top of taxes will. And when you have Lin Dan the greatest player of all time in a tourny, you’re sure to be able to draw some people. Unlike the bozos in the Can Open, who want 20 bucks for qualifying no name brand- no-namers. I do not feel bad for the Canada Open but a pure sense of joy and happiness whenever i see idiots fall on their own sword. 1- I hope they have the money to pay me my meager winnings. 2- No point in coming back cause next year there probably wont be a tournament. How would foreign players make use of the transit pass? They can use it to get the heck out of Vancouver and Canada and never come back to such a yawn fest of a tournament. And all the winners take home a 50 dollar Best-Buy gift card and a one zone month transit pass courtesy of the unreliably expensive money pit that is known as Skytrain.